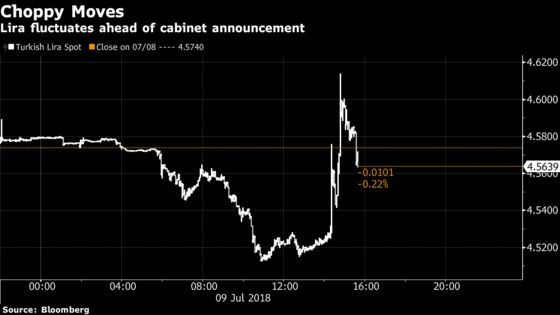 (Bloomberg) -- Turkey’s lira fluctuated between gains and losses as Recep Tayyip Erdogan took his oath as an executive president with vastly expanded powers and before he announces his cabinet. The currency reversed earlier gains of as much as 1.3 percent against the dollar to drop 0.9 percent after Turkey announced changes in central bank law. An official decree removed Article 25 of the nation’s central bank law that says governors are appointed for a five-year term with a cabinet decision and may be reappointed after their term expires. It didn’t set an alternative term. President Erdogan was sworn in Monday afternoon and will unveil his cabinet around 9:30 p.m. in Istanbul. He will appoint members of his cabinet, which is expected be reduced to about 16 in strength from the current 27, and also has the power to appoint other high-level officials. While the new system boosts the president’s powers and cuts those of the parliament, investors are on the lookout for cabinet members’ names that may provide clues on any future policy bias. They are waiting to see whether those with a pro-market image such as Deputy Prime Minister Mehmet Simsek and Finance Minister Naci Agbal made the cut, or if they’ll be replaced by people from Erdogan’s inner circle who prize growth over fiscal and monetary discipline. Erdogan had said he intended to take more control of monetary policy once elected as an executive president. He has also pledged to lower interest rates, putting pressure on the country’s markets ahead of the June 24 vote. His senior advisor Cemil Ertem said in late June that the names of policy makers or cabinet ministers are “meaningless” under the new system. The Borsa Istanbul 100 Index, benchmark gauge of Turkish equities, was 0.4 percent higher, after paring earlier gains of as much as 2.1 percent. The yield on 10-year government bonds dropped 36 basis points to 17.07 percent.